A 19th Century castle on the Conwy coast which has previously been a theme park and zoo will be given a £15m renovation. About 100 volunteers have already carried out work to stop Gwrych Castle's walls from collapsing and held a medieval festival in the gardens. 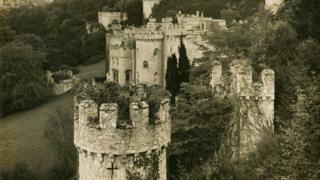 But Gwrych Castle Preservation Trust said it would be 25 years before the whole estate was restored. They bought it with a £600,000 National Heritage Memorial Fund grant in June. Mark Baker was inspired to form the trust 21 years ago, aged 12, after passing the castle every day on his way from his Prestatyn home to Rydal School in Colwyn Bay. He hopes the castle, which still has 300 acres (121 hectares) of grounds surrounding the walls, turrets and towers, will eventually offer holiday accommodation. "A great deal has been done through people's goodwill and by volunteers as well as professionals and craftsmen who have given their time," he said. Gwrych Castle was built by Lloyd Hesketh Bamford-Hesketh from the early 1810s and completed by 1822. It was a stately home for more than 100 years with its own stables, brewery, dairy, bakery and ice house and was visited by Queen Victoria before she took the throne. It was also used to house Jewish child refugees during World War Two and after the war it became a theme park complete with a zoo and a small private railway. World middleweight boxing champion Randolph Turpin trained there in 1951, and in the 1970s and 1980s medieval jousting tournaments were held. From 1985 the site was abandoned to New Age travellers and had a series of owners. The renovation is being funded by grants and investment from private companies. Llyr Williams, of Swayne Johnson solicitors who helped with the purchase, said: "It's a quite fantastic building and one that so many people will have passed as they speed along the A55 but very few have seen close up."